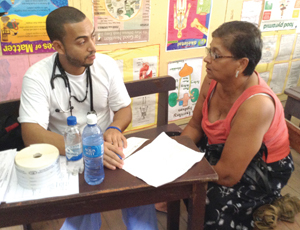 The Guyana Watch Medical team completed their third medical outreach clinic, at Leonora, West Bank Demerara yesterday, treating a total of 490 residents from the community. A large number of persons gathered at the Leonora Primary School compound awaiting the arrival of the team in the early morning. Challenged with their largest turnout so far, the medical professionals executed their duties effectively, completing the treatment of the patients before dusk. Volunteers included students from the United States and public-spirited Guyanese, who were instrumental in assisting the medical staff with their duties. President of Guyana Watch, Tony Yassin, expressed satisfaction with the large turnout, which he says surpassed last year’s attendance. Yassin said that he is hopeful that more persons seize the opportunity in receiving free medical and dental care, at the upcoming outreach clinics scheduled to take place at Timehri, Rose Hall and Parika. 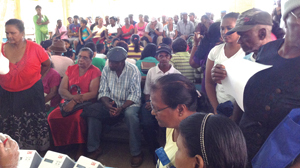 Residents expressed contentment with the medical services provided by the Guyana Watch team. Dentists Apurva Dave and Chiran Reddy treated a total of 92 patients. They conducted cavity fillings, extractions and cleaning of the teeth. Drunarine said that she felt very relaxed during the extraction and was elated in receiving dental supplies. She expressed satisfaction at the team’s visit to Leonora since it was beneficial to many underprivileged persons within the community. The pharmacist, Saurabh Mehta, saw many smiles as he distributed at least three months supply of medication to residents. Hilton Sahadeo was happy in receiving a three-month supply of medication for his stomach ache, as he is physically disabled and cannot work and sustain himself. Pediatrician, Partha Chatergee treated 131 children at the clinic yesterday. He said that the most prevalent cases among the children were rashes. 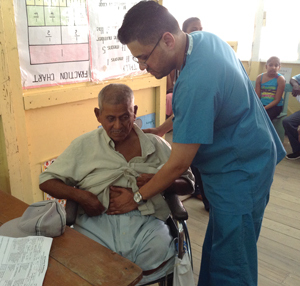 A total of 267 adults were tended to by the Physicians. Many received expert advice on how to treat their specific health conditions. The doctors noted that most of the patients were treated for diabetes, hypertension and arthritis. Bretnol Williams, 56, who was seeking medical attention for Parkinson’s disease at the clinic, was given vital advice. With her expertise, Dr. Sarah Luber, noted that Williams, who was recently diagnosed with Parkinson’s at a community clinic, was not suffering from the disease at all. She insisted that his symptoms were “not consistent with Parkinson’s disease” but rather another psychological disorder. The physician advised the 56 year-old man to cease using his previously prescribed medication, as it may lead to adverse side effects, since his illness was incorrectly diagnosed. She referred him to the Georgetown Public Hospital Corporation where psychologists can better examine and treat his condition. The team is expected to conduct their medical outreach programme at the Sad’r Orphanage on Alexander Street, Kitty today.